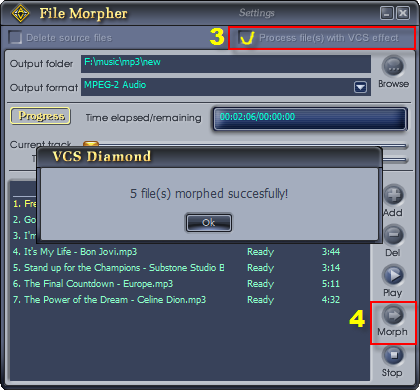 In this tutorial, we demonstrate how to use the Batch File Morpher module of AV Voice Changer Software DIAMOND 7.0 (VCSD7) to apply the same morphing effects (for example: change singer’s gender from male to female) to a group of selected files. 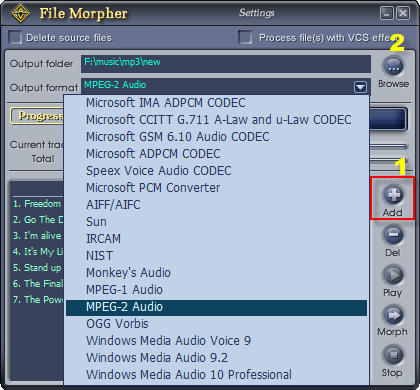 Use these modules to choose the morphing settings for the files first: Voice Morpher, Parody Maker/Mixer, Advanced panel, etc. If you are not familiar with these module, read the tutorials on using them first. Click here to go back to the tutorial page. When you are done with the morphing settings, check check again by using the Player module to know how they will change the audio file. - Check Play songs with morphed effects (1). This let you hear the song with all morphing effects you have set up in VCSD7. - Click Open (2) to choose a file to test. - Click Play (3) to play the file. 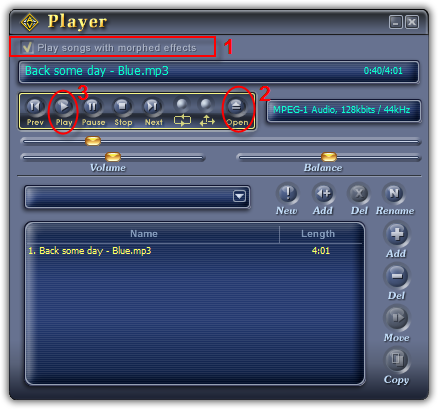 - While listening to the morphed song, you can make changes on the main panel until you are satisfied with the output song. - Click Close to close this dialog box and proceed to the batch file morphing process. 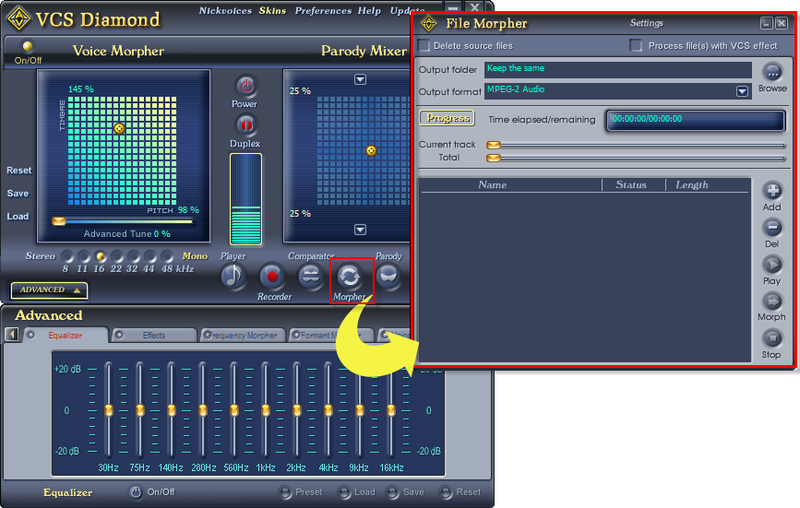 - Click Add (1) to select all the audio files you want to apply the morphing effects. The selected files will be added to the list in this window. - Click Browse (2) to choose where to store the output files when the process is done. - Click Morph (4) button to start the morphing process. After all files have been morphed successfully, you can listen to the newly morphed files by clicking the Play button. - If you want to remove the source files after morphing, check the “Delete source files” checkbox (not recommended).